Review: "Various Artists: CPR Volume IV" - Sea of Tranquility - The Web Destination for Progressive Music! Bill Hammell was inspired to create a web-based community and eventually a compilation of Christian progressive rock, (CPR), talent, from having to search for artists who were creating the kind of inspirational yet progressive rock oriented music he craved, while searching the early Internet. He wanted to create a place where like-minded individuals could go to find similar music. CPR was organized in the late 1990s. It wasn't until later, with the inspiration of Mike Tenenbaum and others he was able to bring together the many bands who were creating and releasing Christian � oriented progressive rock, and in 2004, CPR released their first compilation double CD set, CPR Volume I.
Randy George and Gene Crout continue the tradition with the release of their latest compilation CPR Volume IV. These collections have sold well to progressive rock fans and have included such well-known artists as "Kerry Livgren (Kansas, Proto-Kaw), Neal Morse, Rick Wakeman (Yes) with Ajalon, Iona, Glass Hammer, Salem Hill, Phil Keaggy, and many more"( http://www.cprogrock.com/cprstory.html, 2011). The packages are very well designed, this time with the artwork of Ken Westphal. Only thing missing is a short bio for each band, but at eight pages, including lyrics for each song and a band picture profile, the costs were probably too high to include bios in the CD booklet as well. Besides, each band provides a website address and contact info on their profile page. Personally, I found one of my favorite prog bands, Unitopia, after listening to their 'Lives Go Round' track from CPR Volume III. Hopefully you will also find some favorites on this latest version of the compilations. There are plenty of good bands and songs to choose from. Visual Cliff � 'Exposed' � This track is one of the heavier rock tracks on the entire compilation. Heavy powerful guitar chords, bass, drums and vocals combine to bring out the message being delivered in the lyrics, "He's breaking you down He's building you up". They bring in some keys to balance the harder edge. Eric Parker � 'Thy Life' � This track is off Eric's album 'From the Shoulders of Giants', and is inspired by the words of Frances Havergal, from 1858. It is a deep vocal song with a Christian message. The music is full of deep cello, keys, drums and guitar, and the band does a great job to support the lyrical content with dramatic sounds. Gene Crout � 'Pax Americana' is full of bass, guitar, solid drums and good vocals. This is another of the heavier sounding songs. Not as heavy as the first track, more of a 80s, maybe 90s Dream Theater � influenced, rock song delivering an inspirational message. Iona � 'Let Your Glory Fall' is an excerpt from their latest 2 CD set, 'Another Realm'. The CPR producers must have been very happy to get a chance to debut this track and to have this famous UK band included on the latest version of CPR. It is my second favorite track on the compilation. Joanne Hogg's vocals are some of the best female vocals to grace any album. She and the band do a fantastic job of bringing this inspirational message through very dramatic and overwhelming music. The song is full of instrumentation from the keyboards, bouzouki, beer shaker, bass, violin, whistle, lead guitar, violins and violas. Everything you possibly want in a Gaelic sound. Oh, I almost forgot to mention the drums. They are powerful throughout, but especially dramatic as the song fades with Hogg's vocals drifting off. I am already planning to search out 'Another Realm', based primarily on this song and past albums I've reviewed. Farpoint � 'Calling Out' opens with strong drums delivered by Rick Walker and great bass and lead electric guitar. Then Dean Hallal's vocals "I'm calling out to you 'cause our time is almost through". A clarion call to everyone's fear of the end of days. The immediacy in the sounds of the music matches the message being delivered. Hallal's vocals along with Jennifer Meeks supporting, helps welcome all, as the cool guitar and key solos begin midway through. A great warning and opener from their new album titled, 'Calling Out'. Pursuit � 'Judah' � opens with great keys and bass before the lead electric breaks through to deliver some power chords supported well with power drums. The band launches into a cool instrumental opening which then crosses back over to a short keyboard interlude before all the instruments re-enter and the vocals begin. Another powerful message set to dramatic music. The mid �way instrumental with Mellotron opening is one of the best instrumental showcases on this entire compilation. The blazing lead guitar assault, coupled with the power drums and those cool keys are an excellent return on your investment. Kinetic Element � 'See the Children' opens with cool soft synths, keyboards and bass sounding eerily similar to some classic Genesis, but this is all original music. The drums and slow Hackett � like electric weave a great opening melody shortly thereafter. They do play some excellent Mellotron and organ as well, driving the strength of this keyboard � based music. This track is off their debut album 'Powered by Light', from 2009. Mike Visaggio's vocals, which enter after the long instrumental opening, have a Jon Anderson pitch and sound to me. KDB3 � 'Crisis of Faith' opens with sound effects before spoken vocals and then later electronically enhanced vocals drift out the lyrics over quiet keys, guitar, and electronic drums. Later, vocalist Doug Bowers delivers the vocals with acoustic guitar, keyboards, bass and solid drums. Supernal Endgame � 'Still Believe' is the first of two songs which give Iona a run for the money as the top song on the CD. This song opens with excellent guitar and keyboard patterns set to fantastic drums. The melody will grab you from the opening and carry you through until Rob Price delivers the first vocals, "I call out Your name time and again". There is a similarity in the sound to some of IQ's earlier melodies set to vocals, which remind me of a younger Mark Trueack from Unitopia. In fact, there is even a little bit of an Unitopian feel to the music. John Eargle's keyboard work is exceptional. The guitar solo is another excellent element to this fantastic band introduction for me. Then they pull out the violin and lock in your ears. This is the kind of song that makes you want to hear their entire album. Syzygy � 'Dialectic' is the other big surprise for me on the album. It is my favorite track for a number of reasons. When I learned of their home base near where I grew up, I knew these guys were treated to the great pot pourri of music that I was when I was young. Their music reflects it well. I have already requested a promo copy of their last album for review. The wonderful acoustic guitar and keys which open this track foretell of the magic which will soon unfold. Mark Boals' vocals are unique and the best on this CD besides Joanne Hogg's. The music has a very IZZ feel to it which is another good reason for me to enjoy it. In fact, Boals'vocals remind me a little of Tom Galgano of IZZ. The music is fantastic and the message in the lyrics makes it another reason to buy this disc. Like IZZ, they use the piano and Mellotron keys and synths in bits and pieces which draw in the power of the sound so well. When they take off on an instrumental romp you'll wish it would never end. The King Crimson � like keys and bass will bring back great memories of the past, especially with some of the melodies you hear towards the track's ending. It will bring back all of those memories of when prog was king. This is a big epic, over 16 minutes, eclipsing all of the other tracks on the album and the best way they could possibly have ended this CD. "And it's all because of You!" Rating: 4/5 � Syzygy, Iona, Farpoint, and Supernal Endgame's tracks were the highlights for me. We need more of these compilations to bring out the word that needs to be heard more often. The Christian Progressive Rock advancement group is an organisation formed to help promote bands from the Christian community and back in 2004 they released their first compilation album from some of the acts connected to the group. Coordinated by Randy George (Ajalon) and Gene Crout (America Gomorrah/solo) that release featured a mix of reasonably established progressive acts and some newer kids on the block, with bands such as Glass Hammer, Neal Morse, Salem Hill and Kerry Livgren's (Kansas) Proto-Kaw being featured. Volumes two and three were released in 2005 and 2008 respectively, with the likes of Orphan Project and Unitopia also adding their weight to the project, with all three volumes being extremely well received from both inside and outside of the Christian Prog community. 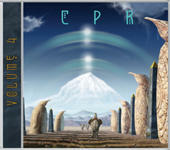 I've no doubt that the unsurprisingly named 4, which is adorned with a wonderful cover courtesy of Ken Westphal (From.Uz/Proto-Kaw) in the finest prog traditions, will receive the same acclaim. With George and Crout both still at the helm Volume 4 again brings together some lesser known prog names with some firm favourites, with the two most notable inclusions this time coming from UK folk-proggers Iona and the simply magnificent Syzygy. First up though are Visual Cliff, who actually come across like a progressive Pull era Winger, which I mean as a huge compliment. A stop start beat and a gritty riff are punctuated by stabs of keyboards and excellently arranged vocals, making for an atmospheric and extremely memorable introduction to the album. "Thy Life" from Eric Parker follows and offers a stark change of focus, with piano and Parker's seductive voice taking centre stage on a song that wouldn't be out of place as a melodic interlude on a Porcupine Tree album with strings and a pleasantly simple beat driving the song along at a gentle pace. Hypnotic and considered, this is a quite wonderful song. Again the vibe changes with "Pax Americana" from Gene Crout himself, as he brings a strong riff to the fore in a similarish manner to Riverside, however Crout's powerful vocal and the soaring guitars and strings bring a more upbeat, if equally atmospheric outlook to what is a compelling track. The first of the big guns shows up in the shape of Iona, who's "Let Your Gory Fall" is a sneak peak from the band's new album Another Realm although it is given an exclusive CPR mix for this compilation. With a hint of the more controlled side of Kate Bush to her voice, Joanne Hogg has the perfect delivery for the intricate and complex folk-prog, with violins, tin whistle and guitars making it easy to see why Iona are getting such positive coverage of late. With an intro that is reminiscent of Peter Gabriel's "Games Without Frontiers", Farpoint provide a more straight forward approach than what has come before and while "Calling Out" is a decent song, Dean Hallal's vocals fail to shine, with his ultra laid back delivery struggling to ignite a simple and sedate guitar line. Pursuit pull off a more Dream Theater like prog metal attack with their excellent chopping and changing keyboard heavy and razor sharp riffs making for a bristling smack, but they also show that they can mix things up with a flute and harpsichord interlude that breaks up the mighty riffage to great effect. Also the John Payne like vocals from Andrew Zuehlke bring an interesting and theatrical dramatic quality to the music. Bringing things back to a more traditional prog territory Kinetic Element use their Yes-like vibe to make for a meandering almost ten minute track that veers from fusion, to sublimely progressive rock and back again. Keyboard player Mike Visaggio also possesses one of the clearest, most melodic voice you could ever hope to hear and really his vocals are amongst the highlights of the whole disc. Possibly KDB3 suffer from following such a confident performance, not that they are bad in any way, but with a shorter song that takes too long to get going their slowly building and atmospheric music hints at stronger songs on their own releases. That leaves the pairing of Supernal Endgame and Syzyzgy to close the album out, with the former's unashamedly dated Saga meets Asia actually being a hugely enjoyable proggy, poppy bright and cheery romp through keyboard driven, harmony vocal laced passages that really could if shortened, make for a mainstream hit! Syzyzgy on the other hand are out and out progressive heavy weights and when you factor in the vocals of Mark Boals (Yngwie J Malmsteen/Royal Hunt/Uli Jon Roth/Erik Norlander) then if you haven't caught up with this act yet, then where have you been?? I was lucky enough to review this band's most recent studio album almost two years ago and here's what I said about the track "Dialect" that is included here. "As eluded to next track "Dialect" takes us back over the ten minute mark and at 16:35 it's the albums longest stand alone number. There's a Steve Hackett like guitar lick which splits up slightly jazzy phases, before a Jethro Tull inspired riff heads us off into some sci-fi sounding keyboards and some sharp time changes under great piano and bass work. In fact Al Rolik (bassist) is often the rock that all the different styles are based round and he does a sterling job of keeping everything grounded. It's a heady mix, however it comes together seamlessly and at no point does this song sound self indulgent or lose focus. The pay off with the uplifting guitars in the final section of the track is well worth the journey!" So there you have it, ten eclectic and on the whole excellent track keep up the strong prog tradition that CPR have already built up with this series of albums and whether you have an interest in the spiritual side that some of these bands demonstrate or not, there's much here for any self respecting prog-rock fan to indulge in. In fact this is one of the best compilations from the progressive genre that you are liable to find anywhere.